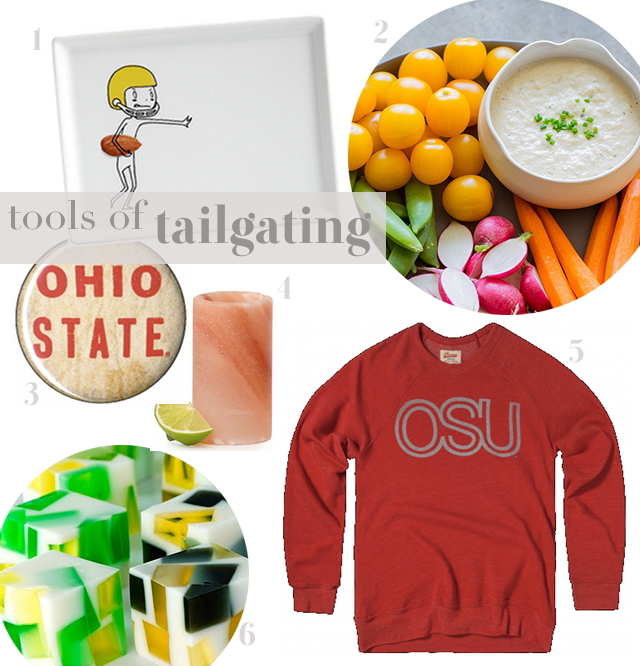 1 - adorable app plates from CB2 -- 2 - tasty + healthy roasted onion dip from the geniuses at spoon fork bacon -- 3 - perfect tailgate favors from homage -- 4 - himalayan salt shot glasses - tequila, anyone?! -- 5 - a cozy way to root for your team, by homage -- 6 - learn how to give your jello shots a little class! Tailgate season is upon us and although I haven't celebrated yet, I've been gathering quite a few ideas and recipes for the perfect pre-game party. Don't get me wrong, I'm not above the red Solo cups of college, but these finds would give any tailgate a little more personality and style.